Another day nearer to the new season of True Blood, which returns in just 3 days time (not that anyone is counting of course). Another day means another promo, this time introduced by Ryan Kwanten. WARNING: There may be a kiss in this promo that you don’t really want to see! As we move ever closer to the season premiere those who have been lucky enough to have seen the show in advance are starting to put up their reviews, and we have a couple of recently posted ones to share with you here. Firstly a reviewer who actually remembers which character is at the center of the story, and it’s so refreshing to read some positive thoughts about Sookie Stackhouse for a change. Sookie Stackhouse is a strong woman now. She screams less, fights for herself more and when the highly anticipated season-five premiere of “True Blood” airs Sunday, Sookie (star Anna Paquin) will knock fans’ socks off as she takes charge of the latest gory and tragic scene at her death-prone house. In case you don’t recall the carnage from last season’s finale, Tara (Rutina Wesley) took a shotgun blast for Sookie when Debbie the werewolf (Brit Morgan) tried to kill Sookie. And then, Sookie killed Debbie. Now, Sookie is fighting to save Tara’s life. Whether or not Tara can be saved is something fans have been dying to know; and thankfully, the complicated answer will reveal itself in a very satisfactory fashion in the opening episode. But let’s go back to Sookie. It’s refreshing to see her be assertive again. This is the Sookie fans fell in love with in the first season. Instead of relying on her vampire lovers Bill (Stephen Moyer) and Eric (Alexander Skarsgard), her werewolf buddy Alcide (Joe Manganiello) and all the other supernatural men in her life, Sookie is taking stock of her situation, bravely making choices. She even lends a hand to Lafayette (Nelsan Ellis). 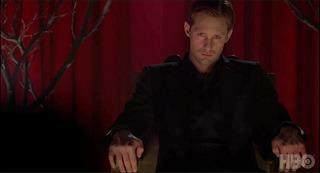 As a result, “True Blood” is fun again. Like Sookie, the writers have regained their mojos by inserting comedy in brilliantly unexpected ways. Expect droll lines from Pam (Kristin Bauer) and the Rev. Steve Newlin (Michael McMillian), of all people. Meanwhile, newly dejected Bill and Eric have their own problems to work out now that they’ve executed vampire bigwig Nan Flanagan (Jessica Tuck). Then there’s that whole Russell Edgington (Denis O’Hare) conundrum. How will it all shake out in season five? If the first installment is any indication, wonderfully. Let’s hope they are right about Sookie! Sookie Stackhouse is taking a break from love. Let’s enjoy it while it lasts. She’s terrible at her job, when she bothers to show up. She takes her friends and family for granted and puts them in harm’s way. She rushes headlong into danger again and again. If she stays alive without a panting, lovesick supernatural safety net, Sookie will move even further away from Bella Swan territory. When she finally shot conniving weretramp Debbie Pelt with Pelt’s shotgun after Tara took the slug meant for Sookie, a different Sookie began to emerge. She’ll need that toughness to survive what’s coming for her this season. Only 3 days to go until we find out which Miss Stackhouse will finally emerge in Season 5. Let’s hope it’s one we can all rally behind.